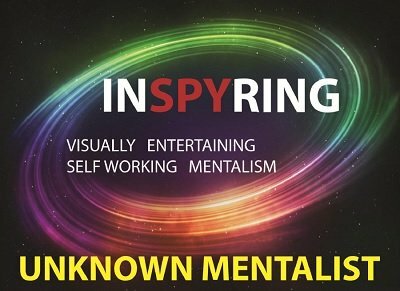 All the owners of In-spy-ring can purchase Con-spy-ring for half price. A fundamentally miraculous but automatic and self working principle but used very innovatively for nine unique mentalism routines. An interesting and captivating script and story. Heightens the entertainment value. Ready to use printable props. Makes the routines very visual. Multiple novel revelation styles. Creates better impact and more retention value for the audience. All the above combine smoothly with synergy to produce nine powerful routines. The basic underlying magic or trick happens automatically and you do not have to 'DO' anything or make any 'MOVES'. So you can focus completely on your presentation. You can start performing the routines within 10 minutes of knowing the 'secrets'. In one of the routines, a time bomb is about to go off. And the deactivation code is determined by the throw of dice many miles away and the 'hero' has to use his legendary telepathy skills to guess the code correctly and to defuse the bomb and save everyone. This he does and you have correctly predicted it. Not only that but you also predict correctly that a special number related to the 'hero's' date of birth is missing from the deactivation code. An absolutely stunner. This can be performed anytime anywhere with anyone's credit card or debit card. You correctly guess a special number related to a spectator's credit card number. This works with any credit card or debit card and is totally impromptu. No swami, no peeks, no impressions. This is based on a very, very little known principle. This is a totally impromptu and self working routine. And the mysterious reincarnation theme creates a powerful impact. It can be done anytime and anywhere with anyone. The fact that the performer reveals who the participant was in the previous birth makes this routine an instant hit. You can play it either mystically or comically as per your own style of presentation. 1st edition 2015, 40 pages. This is crazy. That so much magic is possible with a simple, old math principle is truly unbelievable. Hats off to the author for coming up with such varied applications for this principle. And the methods of revelations are pure genius. Probably this is first time I have come across some dull math getting transformed into a highly visual theatre piece with a great story and lot of emotions creating memorable magic. After reading the routines and revelation ideas, my imagination started running wild with many more possibilities.